It has been quite a few years since I have had a puppy. I recently made the plunge again. 48 hours later and I have to admit it is a struggle, albeit an enjoyable struggle, keeping up with puppy energy. 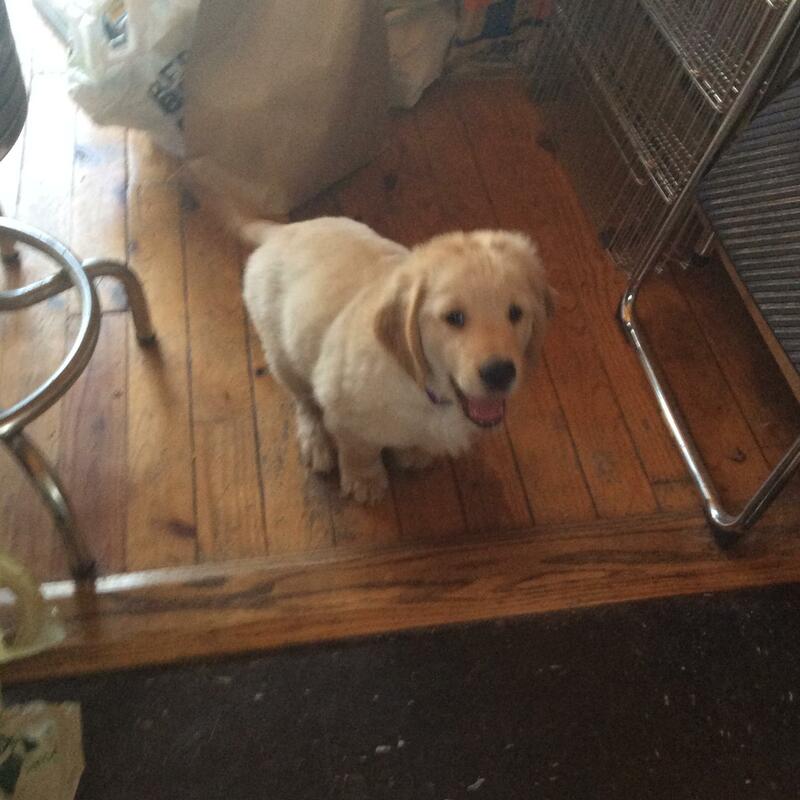 My puppy Shady is a golden retriever, now 9 weeks old. He does not stop – he plays very hard and then crashes equally hard (you learn to appreciate the crash moments). Damage control is a full-time mode. Puppy proofing is a necessity or it is bye-bye to any possessions in puppy proximity. For some reason Shady was attracted to two throw pillows on our living room sofa. He barked at the pillows, not sure why. They must be an attractive nuisance. How long the pillows will escape remains to be seen. I think I had forgotten how oral puppies are. When I am at home, much of my time is consumed with making sure Shady is chewing on the right things. The dog likes to get into everything. Last night he tried to get inside my DVD player. While I have not written about dogs before on this blog, I am a dog person. I grew up with dogs. Among others, I had a weimaraner named Duchess, a mutt named Honky, and a miniature schnauzer named Roman Gabriel. Also, when I first got together with my wife Debra, she had a beagle named Freckles. Freckles was a real character. It would be easy to write a column about him alone. One day when we were at work, he ate the landlord’s couch. Debra told me a story about how he had been stolen once. (This happened before I knew her). She was living in Worcester Ma at the time and she put up missing signs all around her neighborhood. Two weeks went by with no sign of Freckles. Then Debra received a phone call. The guy on the other end (who had, in fact, stolen Freckles) said “You can come get your dog now”. When Debra went to pick up Freckles, it turned out that that very cute beagle had eaten the guy’s apartment. Over the last 29 years or so, I have owned golden retrievers. There was the regal Rainbow (the first), placid and incredibly good-natured Tasha (an unbelievable swimmer), Toby ( golden mix we adopted), Rainbow (the second and not always the best behaved), Molly who lives to eat, and now Shady. Molly is 14. She is my longest lived golden and has totally outlived my expectations. The dog is in the heavyweight category. She keeps trucking although I would have to describe her response to the puppy as not unalloyed joy. I had planned to write a more serious piece this weekend but Shady shot that plan to hell. Puppies require so much attention. On the other hand, I don’t think there is anything I would rather be doing. Shady is a great guy and a most entertaining and lovable companion. I am surprised how easy it has been for him to transition to our house. My brother Rob said that puppies are harder than babies. Before Shady it has been a while since I have had either experience but I would have to agree. I did create a comfortable and secure fenced-in area to try and minimize destruction. Still, when Shady is up and about, you need NSA surveillance capability. I am taking advantage of a lull in the action right now to write this. Not sure how long the lull will last. I do feel a bit ADHD-like in the puppy aftermath. My concentration is scattered tending to the puppy. I had told my wife that this is my dog so I did want to step up and be his primary caretaker. “Dogs are our link to paradise. They don’t know evil or jealousy or discontent. To sit with a dog on a hillside on a glorious afternoon is to be back in Eden where doing nothing was not boring – it was peace”. Shady – great name for what I’m sure is to be a great companion (even for Molly who may not be enthralled at the moment, but is no doubt secretly pleased.) I forgot to wish you good luck on Thursday; but you are an old hand and don’t need any! Can’t wait for the many war stories to come. Love the story about Freckles… you’ll have to tell more. Nice piece Bro look forward to meeting Shady.